The FAQs are here to answer common questions about publishing your book or making visual notes . Here you will find information about the processes that have worked for me, how to develop content, help with editing and more. Can’t find what you’re looking for? Please contact me for assistance. This map can assist you with planning your book publishing. Is publishing a book right for you? 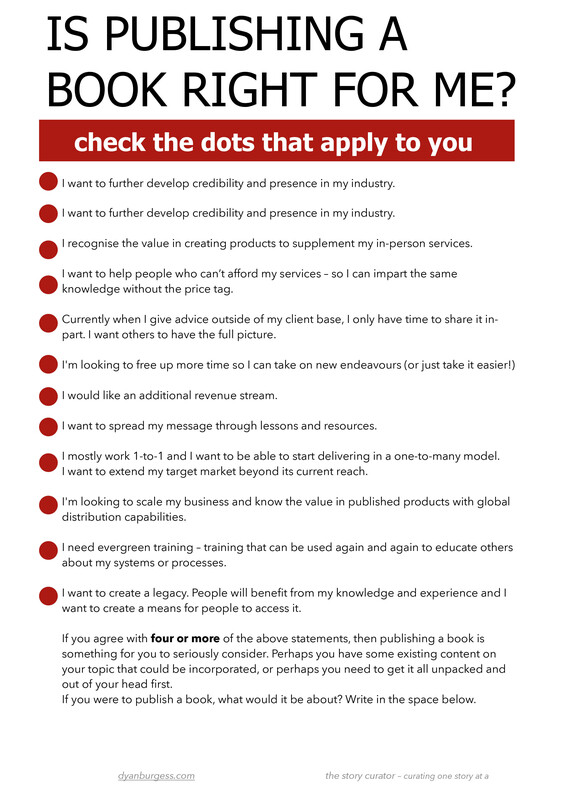 Download this quick checklist to see if publishing a book is right for you. DOWNLOAD – Is publishing a book right for me? 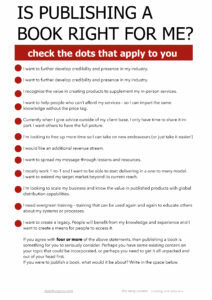 If you are not sure how you can leverage from the value of a visual note, perhaps this flyer will assist you. What can I do with a Visual Note? Chop up into smaller pieces ‘digitally’ and utilise as gifs, icons in PowerPoints, social media or for website use. Transfer to a smaller version as a poster, mouse mat or A4 piece of paper. Users can scribble on or reflect to generate more ideas. Utilise as a header for blogposts, LinkedIn header, Facebook banner. Laminate and put in your place of business as a conversation starter. Use as a backdrop, instead of a pull-up banner, when presenting live or other video recordings. Instead of a PowerPoint presentation, use the image and talk to each point – i.e. retelling the story again and people can follow the journey visually. Hopefully, you get the idea. It is only limited by one’s imagination. My personal preference is the Evernote grid version. The faint grid lines help me draw straight but disappear when I copy or scan the image. When using pen, it’s important that you use waterproof to avoid smudging. Pens can range from 0.005 to 2.0. For beginners it’s useful to have a range of line sizes, say 0.1, 0.3, 0.4 and 0.5 pens. However, if you can only choose one pen, I’d recommend the 0.4 size. Currently my brand of choice is Unipin as they are readily available at most stores and don’t tend to bleed on planes (very messy story there!). If you know that you will be copying or scanning your images, test how the different pens work for your copier or scanner. Usually, the smaller sizes – 0.005 and 0.01 – can become difficult to see. However, it depends on the machine that you are using and the ultimate result that you want. 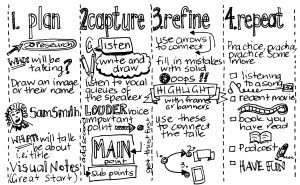 Interested in learning more about visual note taking?  Mike Rohde’s books, The Sketchnote Handbook and The Sketchnote Workbook, are wonderful resources for building your skills.  Lynne Cazaly’s books, Create Change and Visual Mojo, will also help build your drawing skills.  Guy Downes (www.guydownes.com) has been in the industry for over a decade in Australia.  Think in Colour (www.think-in-colour.com.au) is the brainchild of Jessamy Gee and provides a bright and vibrant summary of concepts. 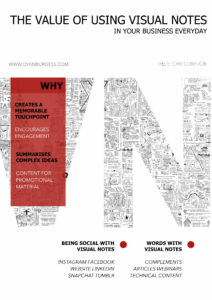 What is a Visual Note Taking Handbook? 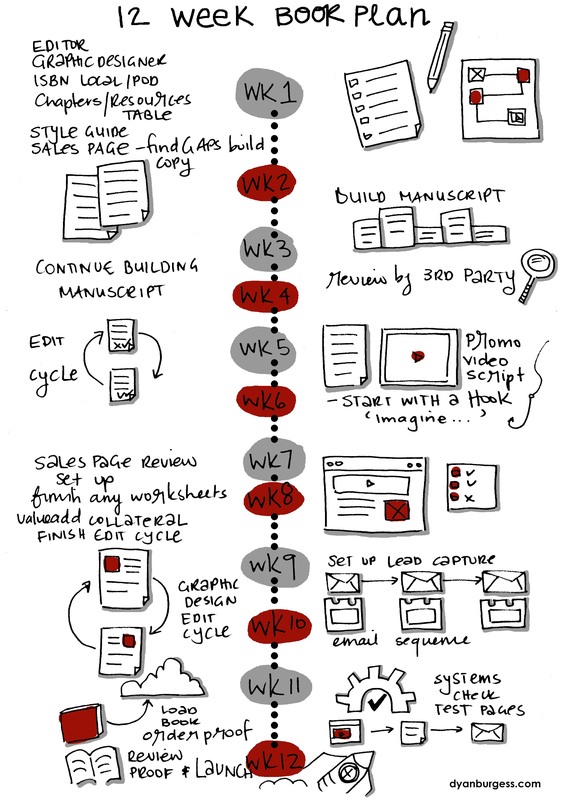 A handbook is a starting point for your own visual note taking journey. There are many different reasons for taking this journey. For some it will be the enjoyment of drawing and creating. For others it will be the challenge of developing a new skill. And for many it will be a desire to learn and remember more (after all, that’s usually the reason we take notes). Whatever your reason, the good news is that you can start today! My Visual Note Taking Handbook is a collection of more that 50 visual notes that I have created over the last few years. They are not about showing you the right way to do visual note taking, but rather to help you with ideas to get you started. I’ve kept the book nice and compact so you can carry it with you for inspiration, while building your own techniques. The beautiful thing about this process is that you will develop your own creative tricks and styles; the outcomes are as diverse and complex as our individual brains. One important point to remember is that there is a difference between art and visual note taking. Don’t become intimidated by note takers who are artists. 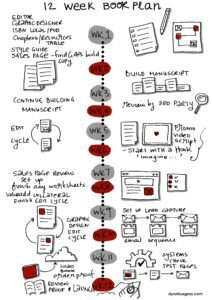 The main thing is to develop a style that suits you; just engaging in the process of visual note taking will have amazing benefits for your creativity and your ability to learn the content, so relax and enjoy! When starting out you can simply use the images, shapes, symb0ls and pictures that you are confortable with (for some people this is essentially letters, numbers, arrows, and shapes, with the occasional star or flower). But you can be guaranteed that this ‘toolkit’ will gradually grow as you develop your skills (most visual note takers practice drawing specific pictures as they discover gaps in their drawing ability). My spin is slightly different to Veronica’s as this is what works for me. You will work out what works for you and create your own version. So, welcome to the world of visual note taking. I hope your journey is as enjoyable and educational as mine has been. 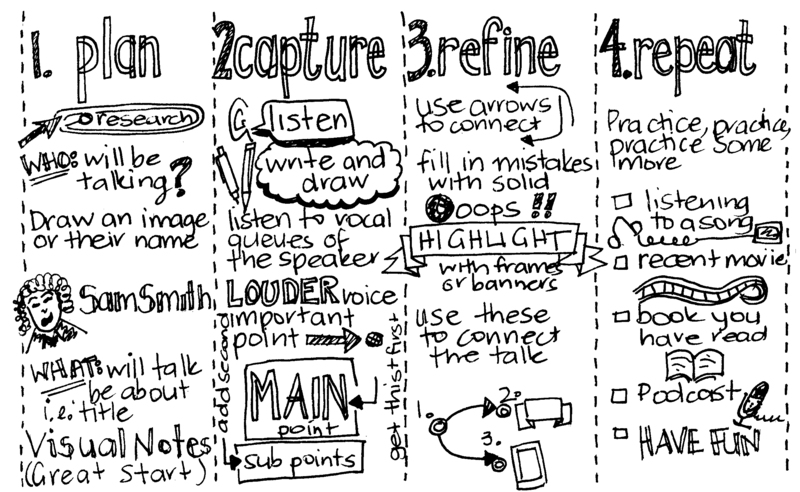 How can you use Visual Note Taking? Live visual note taking (or live scribing) can assist you and your audience to connect thoughts sooner or allow teams to collaborate in a more meaningful way. Using a visual note taker can assist you in clarifying your goals by showing connections in real time and allowing you and your team to connect ideas. Final images can be used in your social media, to assist with your business or customer strategy. You can even print it on coffee cups and bags! 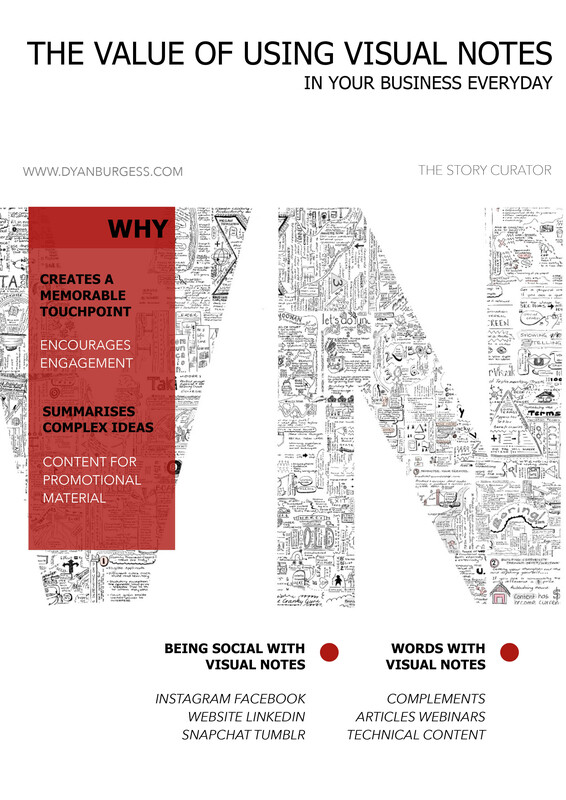 What is visual note taking? A way to connect complex thoughts and ideas via images and words. To make the complex less complex. It can also assist with distilling the steps of a process to help better understand a problem and to come up with a solution. Visual Note Taking can assist with better memory retention through the use of visual cues. Before I send a book to an editor I run a basic edit and grammar check. Having a manuscript as tidy as possible before the first run to the editor can save time, money, and confusion for everyone. The checklist following is the one I apply. Once your manuscript is ready for printing you need to check the proof from the graphic designer. Unfortunately, the conversion of a word document into a design file can see some things change from your original intention. You must closely review the proof. I am a firm believer of paper-based proofreading. Yes, this may mean printing out your 200-page book, but it is worth it. The checklist I have developed is set out below. 3 Is the blurb shown on the back cover correct? Below is a general outline of issues and tasks to consider when creating a book. While there are various types of books, and the specifics may ultimately differ, the issues and tasks below should be considered. It is a good idea to update the table as you go to ensure issues and tasks are not overlooked. 1. Open a new folder on your computer, or in Basecamp, and label it ‘[Your Book Title]’. 2. Create an internal issues list to centralise additional considerations and source documents used. 3. Consider the style for the book, e.g. will the book contain chapters or will it be a short book? 4. Consider the topic for the book and compile relevant articles, fact sheets, and blog posts. Centralising them into a single document in a structured way is usually the best way to do this. 5. When working up the book, please consider the guidelines or standards for your genre and if they need to be followed. That is, copy and paste the content into the book and rearrange in a structured way. Once arranged, make amendments in Redline so that the changes to the settled source documents can be easily seen. 6. Ensure paragraphs do not repeat themselves in the book as source content may contain the same paragraph or information. 7. Ensure terms are defined only once. Also, consider whether it is worth defining particular terms. 8. Consider if footnotes are to be used. If footnotes are not to be used, ensure the information is otherwise integrated into the book. 9. Consider if a glossary should be used. 10. Consider if a contents page is appropriate. 11. Ensure the chapter flows for consistency (style and formatting). 12. Ensure all wording is ‘timeless’, if possible—e.g. avoid using terms such as ‘recently’, ‘as discussed above’, etc. 13. If blog posts are used, consider integrating them as case studies or examples. 14. Ensure all diagram formatting is consistent and is of high quality. 15. Ensure that there are no annexures or schedules, unless appropriate. These should be integrated into their respective chapters of the book. 16. Ensure a checklist review is undertaken at least twice, including just before submitting to formatter. 17. Include an introductory paragraph and a blurb (that will be inserted on the back cover of the book). 18. Include additional sections for ‘About the team’, ‘Acknowledgements’, and ‘Disclaimers’ before the ‘Introduction’. Ensure you acknowledge all contributing authors by name in the ‘Acknowledgements’. 19. Provide the document to a colleague to review. 20. Once settled, the author should arrange for the book to be reviewed by a publisher/editor. 21. Consider using an external copyeditor/proofreader. For those who are not interested in an online project management tool, perhaps a table or checklist of key steps is more useful. Below is a sample of a timeline or to-do list to keep you on track with where you are at, or more importantly, where you need to be. This can assist in keeping you motivated and on task to complete (ship) your book in a timely manner. Remember, your goal is to independently publish your book. This table is not exhaustive or compulsory. Set time line of tasks e.g. complete this table! Set one hour per day, every day, to work on the book until it is shipped. Collate potential content from existing resources that you have created. Finalise manuscript into a format that can be sent to an editor. Note comments from the editor and accept or reject as you see fit—this is your book. Where can I collate my content from? The first question to ask is, ‘What content have I have already produced?’ Consider what content you have already developed; e.g., standardised responses to clients; blog posts; interviews; articles you have written for publications, magazines, or other printed media (sometimes you will need permission to use these). What content is sitting on your website or sitting in a filing cabinet from mailouts, newsletters or work from previous customers. Collect all of this information together. The next step is to batch your content into similar themes/categories/topics. Then you can analyse where you need to add or remove content and what seems to be a logical order for your text to be arranged in. Is your book The Five Steps … or 7 Ways to … or 101 Hints and Tips for …? What is the goal of your content and your book? What solution does your content offer the reader or user? Understanding these questions will simplify your content structure. These questions will also assist to produce your introduction and conclusion. The theory here is that if you know your goal, your introduction and conclusion will write themselves … not quite, but you will have a very good sense of where to start and where to go. A basic content structure can be formed from this process. When you see books that you love the look and feel of, take note of what experience you loved about the book. Would you like readers of your book to have the same experience? The terms below may assist you with providing your designer or anyone else who is assisting you, with independent book publishing industry ‘language’ to allow clearer communication of your thoughts and ideas. Amazon As at 2015, Amazon is the largest American-based online retailer. It was established by Jeff Bezos, which started selling books and then diversified its products to include electronics, fashion, video games, software, etc. Kindle Books is the proprietary eBook invented by Amazon and requires a Kindle eReader or the Kindle App to enable reading of the eBooks. App Short for the word ‘Application’ when referring to the program that you download to your smartphone or tablet. Author Bio/Page (in the book and online) In a book this is the page that identifies the author and provides biographical data about them. It may contain their photo. Online platforms such as Amazon, Smashwords, and independent publishing houses have established dedicated author pages, which allow the author to display details about themselves and their publications, as well as an image. Barcode Originally utilised by railway companies to track their equipment, the humble barcode revolutionised the ability of the grocery industry to be able to quickly and easily mark stock and track inventory. The ability to scan a barcode with an optical machine quickly saw the barcode transferred across many industries, including book publishing, to automate tracking, pricing, and updating data of stock. Basecamp Basecamp is a cloud-based project management software system. It allows users to monitor and collaborate on a project from end-to-end, you can also add in third parties with limited access, which means you don’t need to follow up lots of messy email threads. As an author this can make life so much easier and less confusing for all involved. The other benefits is being able to communicate with each other in real time no matter where the team is based in the world. Blog Originally known as a ‘weblog’, blogging quickly became a platform for people to voice their thoughts in an open forum. Blogs are now an integral part of many businesses’ communication with their customer base. Blogs have also created their own ‘blogosphere’ and there are numerous blog types, from personal, to genre and media, to device-based. Entries on a blog are known as ‘posts’ and are typically displayed in reverse chronological order (that is, the most recent post is first). As an author a blog can create a community of followers who want to communicate directly with you as well as significant. Blurb The limited text that is on the back cover of a book. Also considered a promotional or publicity statement. It can assist you to clarify your pitch and why you are writing this book at this time. Book exterior Simply the outside of the book. In publishing industry terms, the exterior will also be defined by terms such as: hardcover, paperback, softcover. The type of cover that you choose will depend on the message you want to send to the audience, and your budget. Book interior The inside of a book. All those pages that you have been agonising over for months or years, bound together in a logical order for you to share. CIP Cataloguing-in-Publication (CiP) is a free service offered by the National Library of Australia. Essentially it allows your book to be found easily by libraries on their database as well as extending your listing in their ‘Trove’ records, which is a catalogue released to a worldwide audience. Cloud Cloud is a term that has been become common parlance in today’s computing world. Essentially, it means that you can access your data no matter what device you are on, no matter where you are in the world. Why, you may ask, would you want to do this? For me, cloud-based programs have allowed me to connect with people all over the world and allow people to run their work schedule into their lives rather than having their work schedule run their lives. A bit extreme? I don’t think so. Think of the applications that you use on a daily basis that are cloud-based: iTunes, Spotify, YouTube, Facebook, Instagram, Twitter. All of these applications offer you an ‘interface’ to log into your account from any device and communicate with a group of people, or the world. You may also be using cloud-based products for your email, balancing your end of financial year accounts, and interacting with your bank. For me, another major benefit is that I know that this offers a back-up to my desktop computer and my back-up hard drive. As an author, knowing that you have another copy of your manuscript if all else has failed is a huge plus. CMYK Cyan—Magenta—Yellow—Key. So how many times have you changed ink in your printer and not thought twice about what those letters mean? Printing is typically done in this key. Why is this important? What you see on your screen and what comes out of the printer can be different. Your computer screen operates in RGB (Red—Green—Blue) while your printer usually works with CMYK. If illustrations and images are not part of your work then this is not a concern. If you have images then you will want to check how these look printed as compared to your screen and ask for assistance if there is a variation of colour that distracts from your message. When uploading a book to a platform, it will advise what colour key you need to upload your file in. You must follow the requirement, otherwise your book will be rejected. Even if the file is black and white there can be a requirement to provide the file in CMYK black format. Copyright There are different laws for different countries. In Australia copyright refers to the author’s legal right to their work, as recognised and protected by law, protecting it from plagiarism, misuse, and false or wrong attribution. You can submit your works as they are completed to the Copyright Agency of Australia. If your work is used in particular environments, for example pages copied for research in a school or university, you will be paid funds for the use of your works. Part of the Amazon Group. This platform allows authors to independently publish their own work. With help in all aspects of the book creation process from concept to actual writing and editing, and then supported by marketing and distribution. CreateSpace is a great resource to meet and find marketing strategists, third party editors, illustrators, artists, and other collaborators who can help you develop and launch your work. This term has become commonly used with businesses realising that they need a user-friendly interface (web page) that allows users to easily navigate through all the data input and information required. It has been suggested that it is similar to an automobile dashboard because of the way they can be used as a guidance system to get you where you need to go, in a virtual sense. Database/s A collection of data that is easily accessed and managed because of its organisation and structure. In the world of ‘internet this and cloud that’, it is inevitable that you will be part of a database for something, somewhere. As an author you will become part of the database of the platform you choose to use; for example, Amazon, or part of the National Library Archive Database. Digital Printing The evolution of digital printing has become the cornerstone for short run printing to be available at a relatively low cost for the independent author. While the quality of digital printing may not be as high as the offset printing technique, allowing authors to reduce their costs for production and reducing the risk of holding large volumes of stock is, almost always, worth the trade-off. Should you have large success with your publication you can look at the more expensive large print run options. However, until then, the digital print option will be your best friend. Dropbox This is a cloud-based file-hosting service that allows data storage, cloud access, and user interface, all combining to make possible the storage, dissemination, and sharing of huge amounts of data that would have been difficult to send or transfer through normal email channels. Users are given their own individual folders to access their stored data in the cloud through many channels such as laptops, desktops, tablets, and mobile phones. As an author the ability to know that your manuscript and research is stored somewhere other than on your computer is a relief. This also means that it is easier to share with others who will collaborate with you on your book. Electronic book or a publication in digital form, which is usually read online or downloaded onto an eReader device. eReader The collective name for devices such as Kindle, Kobo and Nook, which are a specific electronic readers for eBooks that allow the user to store multiple books for reading on the device (the range of books able to be stored varies from reader to reader, however is generally between 2000 to 3500 books). EReaders were developed to move away from the backlit experience of reading on a computer or mobile screen which can cause eye strain with the light directed into your eye. The eReader uses e-ink which is intended to mimic a paperback experience and cause less eye strain. I constantly have conversations with people about the use of the eReader to the paperback. For me you can’t beat the convenience of the eReader for travel and portability. I can have 5 books on the go and not worry about what page I was on and where I left my books, and my eReader (Kindle) syncs back to my smartphone (iPhone) and tablet (iPad). I have a wish list of apps on the go and one of them is that an app developer makes an app that allows me to be able to handwrite on my ebooks, draw pictures, post sticky notes, and highlight sections, like I do with my paperbacks and have those notations sync across all my devices…ok I have said it, now let’s see how long until the universe sorts it out for me. Evernote and OneNote have similar ideas in their platforms, however not quite the vision that I see. End papers End and front papersare only produced with hardcover books. The method of constructing hard cover books requires ’end papers’ to attached the interior neatly to the exterior. End papers can be one colour paper, other times you will see that is so amazing you will find it hard to start on the text. Changing printing techniques and technology are making this method available to soft cover books as well. This can be a great design enhancement for your book, having images or text in the end paper positions. ePub This is the standard file format for International Digital Publishing Forum. Essentially, there are two types of eBooks: mobi, which is exclusive to Amazon, and ePub, which is used by everyone else. Feels a little VHS and Beta (for those who remember that race!). Fishpond.com Originally established by Daniel Robertson in 2004 as the first online book store in New Zealand. With a slogan of ‘millions of books, music and movies’ it has a firm following with sales in 2013 of 20,000 per day. Font During the time of analogue printing the definition of font was important as it let the typesetter know what point size and typeface they need to select when putting together the letters into a frame. With the rise of computers, font became interchanged with typeface. As you will see when you use the font menu, it asks which font you would like to use, not which typeface. Technically, font is a subset of a typeface, however the digitisation of typesetting has changed the use of these words. Format This term in publishing can relate to a number of meanings. Typesetting, formatted text, layout of the book or simply the type of book. The context of the use of the word should assist with which meaning is being referred to. For example, ‘the format of the book will be 6 by 9 inches with approximately 200 pages’. Here format relates to what the size and look of book will be once printed. Another example is, the format of the book is to be based on large areas of white space. Front Papers Refer to ‘end papers’ above. Gloss This refers to the finish of the paper (interior) or cardboard (exterior). If it is shiny then it is likely to have a gloss finish. The treatment to obtain a gloss finish is different for paper (interior) and cardboard (exterior). A book exterior will need to be treated with a gloss cellulose cover to allow this finish. A gloss vs matte finish is a personal consideration, depending on the market that you are appealing to, the content of your book and your budget. Google It is hard not to know about this word in today’s internet-based world. According to Wikipedia, Google was a mis-spell of the word ‘googol’, which is the name for the number one followed by one hundred zeros. Regardless, the name is now part of many people’s vocabulary, with ‘Google it’ being the answer for many questions raised by people young and old. The ability to have a search engine (technical name for the program that searches for the answer to your words in your search function) operate with such a broad scope has allowed consumers to find and relate to products and people in a way that had not been previously possible. While Google lives by the mantra ‘do no evil’ the information that is available to the ‘Googleverse’ remains controversial. Each time you log onto your computer and are connected to the internet Google is watching what you do. (Fox Mulder would be saying, “The truth is other there.”) The point here is to learn how this can work for you as an author and how to expand your audience with consistent messages wherever you mark your thoughts on the internet. GSM This is an initialism for ‘Grams per Square Metre’. GSM refers to paper weight. As a point of reference standard photocopying paper is usually 80gsm. Unfortunately not all papers are made the same and while 80gsm may be the paperweight that you are advised to use it is good to ask for a sample so that you can see what it looks and feels like before you confirm if you will use it. Hardback/hardcover A book with a cover that is made of cardboard, leather, or cloth, in other words the book cover, feels hard and is inflexible. Hardcopy A term like ‘hardcopy’ has evolved with the internet and computers. Hardcopy is the printed paper version of a document, book, or publication, as compared with its digital counterpart, which is called a softcopy. Hyperlink When hovering your mouse over a document or an internet page you will notice the ability to ‘click’ on certain underlined contents. This is called a hyperlink. It makes life easier for the user of your book or website to be able to easily reference the data referred to by simply by clicking on it. In books, this can also be used to allow readers to ‘click’ directly to a chapter. Imprint page Traditionally this page was found within the first few pages of opening a book. Now with the rise of more input by authors in independent publishing, imprint pages are finding themselves often at the back of a book. Essentially, it is a summary page of the bibliographic information of the book: author details, publisher, and cataloguing details can be found here. ISBN Initialism for ‘International Book Standard Number’. Essentially the allocation of a number to each book issued under a title. For example, Bake a (Business) Book has an ISBN for the paperback version, another ISBN for the Kindle (mobi) version, and another ISBN for the ePub version. These numbers assist with the cataloguing and tracking of all books published on all media types. Initialism for ‘Joint Photographic Experts Group’ which is known as a process that compresses files with colour images into a fraction of their actual size. File names have the ‘.jpeg’ letters as the extension to identify this file type. Justification This is how your text sits on the page as compared to the margins of the page. Here is an example of left justification. You will see that the text lines up with the left hand margin. Here is an example of right justification. You will see that the text lines up with the right hand margin. Here is an example of centre justification. You will see that the text lines up with the centre margin. Here is an example of full justification. You will see that the text uses the full space available within the left and right hand margins. Your graphic designer will assist with the appropriate justification for your book when you are at the design stage. KDP Initialism for ‘Kindle Direct Publishing’, which is the Amazon platform to allow independent authors and publishers to easily upload and publish their books using the Kindle program. There are supporting marketing tools within this platform to assist with awareness of your publication. Kerning that is too tight. The aim is to make reading the text as easy as possible for your audience. Kindle Usually referred to as ‘Kindle’. This is the device that is required to read Amazon Kindle books. You can also purchase content direct from the Amazon store through the Kindle. EBooks within the Kindle platform are done on the proprietary code, mobi, developed by Amazon. The common code within the publishing industry for writing eBooks is the ePub format. If you want your eBook on Amazon you need to put it in mobi format. Kobo eBook reader developed by Toronto-based Kobo Inc.
By law you are required to send a copy of all forms of published books, printed and electronic versions, to your state/territory and country libraries, and on occasion to your Parliamentary library. Lower Case This refers to the ‘small’ version of letters when typing for example a, b, c, d as compared to A, B, C, D, which are uppercase. The naming of lower case is derived from the days when printing was done letter by letter on a printing press. The smaller letters were stored in the lower part of the case (the shelving system for the hundreds of letters that the typesetter needed easy access to), hence ‘lower case’. Manuscript Any handwritten or typewritten document. In the days before printers and computers, to produce a manuscript was very time consuming. While developing a manuscript is still an involved process the ability to utilise technology to leverage other medias to create your manuscript makes the process much more accessible to everyone. Say for example, a person who cannot type or write easily, could video tape or dictate their manuscript and be helped to make it into a paper manuscript. The doors that this opens are numerous. Matte Flat finish of paper as compared to gloss, which is shiny. When deciding about the design of your cover you will need to consider what type of finish you would like. Having your collection of ideas about other books that you like will assist with providing your designer and printer clearer guidance on what you see in your mind as the final result. Metadata Is simply data. Traditionally metadata was centralised in library catalogues to assist users to find relevant information in relation to their search topic. With the coming of the digital age this has expanded to all digital platforms. Good metadata will assist browsers find relevant information more easily. You can see where Search Engine Optimisation starts to become a part of metadata on the internet. Mobi Proprietary file type for Amazon Kindle books, i.e. the eBook file type, which can only be read with Kindle readers or the Kindle app. Moleskine Moleskine was developed to bring back the ‘little black notebook’. According to Moleskine’s website, Bruce Chatwin was the main catalyst in the Moleskine story. He apparently gave the book its name and was known to buy all the Moleskines he could before he travelled. It seems that Bruce was not the only one who loved these notebooks, and the revival of these books in 1997 by a Milanese printer has seen new generations continue their passion of handwriting notes. Nook An eReader developed by book store Barnes and Noble. There is the Nook device, and the tablet option is the Samsung Galaxy or the Nook app. Offset printing A printing process that transfers an inked image from a plate to a rubber blanket and then to the paper. Very commonly used process for printing based on the sharpness of the result. Preference is for use for larger print runs of books as there is a minimum set up time and cost to have printing done using this technique. Paperback A book that has a flexible card or stiff paper as its cover. The interior is usually glued (perfect bound) together instead of being stitched or stapled. Most books you see in books stores are paperbacks. PX pixels Origin of the word is from the words picture (pix) and element (el), and became pixel. Represented as px, this is the smallest element in a digital image. This drives the resolution of the images that you see in the digital world around you. Are the images you see clear or are the fuzzy? For example on your phone you will usually have a 540 by 960 pixel resolution while your High Definition Television will be in the range of 1080 by 1090 pixels. If you try to watch a video or look at an image that was made for a smartphone on a computer screen the image will look fuzzy and in chunks of squares (you will see those individual pixels). PDF Initialism for ‘Portable Document Format’. It may be an image, illustration, or the digital equivalent of a printed page or pages that may be viewed, read, shared, and sent electronically. Perfect bound Usual process for binding paperback books. The individual pages of a book and its cover are bound together by an adhesive. This is usually done under heat then pressure to stabilise the construction of the book. Plain text With the age of word processing, ‘code’ or ‘hidden instructions’ are part of documents to allow things like font type, paragraph spacing, and margins to be transferred from one word processing program to another. This information can sometimes cause issues between word processing programs and versions and email readers. Plain text removes all the ‘code’ so that only the text remains. While the formatting and pretty type choices won’t be able to be displayed with this option at least you can read what is meant to be read. PNG Initialism for ‘Portable Network Graphics’ or the compression of files without loss in data. Finding formats that allow designers to transfer files for use in a reliable way has seen the invention of the png file type. POD Initialism for ‘Print-on-Demand’. This process has changed the landscape of the publishing industry. The ability to print a few books for relatively little money has opened up opportunities for the independent author. Particularly in a world of ‘long tail’ demands (Chris Anderson—Wired) where consumers want niche products. Print-on-Demand delivers this opportunity to authors and consumers. Print run When you want to order a batch of books in bulk from a publishing house it is known as a print run. Each publishing house will have requirements for a minimum number of books to be printed in a print run. Alternatively, a company like Amazon, which has CreateSpace as its POD division, allows orders of only one book. The quality of the book varies depending on a number of factors and depending on the result that you want to achieve you may need to spend some time researching the type of POD printer that will suit your needs. First copy of the book in printed format, although proofs may be produced digitally as well. Never underestimate the value of a proof to review and reconsider your book. It is important to see your work in print before you hit the final print button. Reading the manuscript to spot errors and implement minor corrections to grammar and punctuation. It is important to understand the differences in the editing process. Each level of editing considers particular components of a manuscript. When working with an editor ask for clarity around what they will actually be doing for you and whether this will get your book to the final version. Terms used by editors can be confusing. Be sure to clarify what you are actually paying for. Rich text format Type of document format produced by Microsoft Word and one that is read by many processors. Saddle stitch Thread is sewn in sections to tie the pages of the book together. Sentence case The capitalisation of the first letter in the first word of a sentence or heading. SEO Initialism for ‘Search Engine Optimisation’. Optimising your SEO to make you ‘number one’ in a range of key search words so you can be found at the stroke of a key or two is ubiquitous. This is a double-edged sword for the consumer. Typing in keywords will show you what you have searched, however is it what you want to search for? Integrity and honesty of your data becomes the cornerstone of your messages to the world. Title case The capitalisation of the first letter in the relevant words in a sentence. An example is ‘The Title of this Book is the Title’. Smashwords An eBook distributor company founded by Mark Coker that assists independent writers and publishers to connect with eBook retailers. Writers have absolute control over their work throughout its various phases, from editing, marketing, and distribution, to sales. Title What is the name of your book? This is called the ‘title’—more technically, the distinct name of a piece of work, such as a book, a chapter, a song or musical composition, a poem, a portrait, a short story, a novel, or other such material. Being an author, the main use of the word ‘title’ will be around the wording that is on the front cover of your book. It is important to understand this word as it is used in many cases for data entry and it is important to be consistent with your data entry. Track Changes Function in word processing programs that allows users to makes changes and comments to a document, in a manner, that can immediately be seen by others for easier editing and feedback. Trim Size Technical term for the length and breadth of your book. Term comes from ‘trimming’ the paper to the same standard size. The history of written language is long. Since the beginning of the use of an alphabet, from those first Phoenician scratches to the modern English alphabet, people have defined their artistic nuances of the written language. How we formed letters was initially restricted by the tools used to generate it. First sticks, stones, and fingers, then brushes and feathers until the print press came along. With the print press came typeface. Typesetters would meticulously set up thousands of letters into cases to create words, sentences, and paragraphs ready for an ink roller to pass over before being transferred to paper. In saying this, print allowed the duplication of information as never before where books needed to be handwritten if a duplicate was to be made. The setting up of the letters in their casings ready for printing became known as the typeface. Now with computers it seems that there are no rules to stop a typeface from becoming a reality. As in the old adage however, just because you can, should you? There are some typefaces that should never have seen the light of day, but then again maybe they helped to inspire a typeface that is more readable. A beautiful book titled What’s My Type by Simon Garfield provides a wonderful history of type and fonts in all their glory and splendour. Reading the history of those type designers cutting individual letters provides a whole new respect for what they did to create the typefaces of their times. They applied such skill and care to make reading a better experience for the general population. So what is a typeface? It is a series of fonts that each have their own unique design. Common typefaces are Times New Roman and Arial. Within these typefaces are the font subsets, for example, 10 point italic would be a font type. Typeset The procedure of placing letters into a format that will make it ready for printing. In the days of the print press this was the inserting of thousands of letters into a case; today what you simply have is typed up in word or you can arrange for a graphic designer to be involved and make things more fancy. 1. The art or process of printing with type. 2. The work of setting and arranging types and of printing from them. 3. The general character or appearance of printed matter. Upper case Often referred to as capital letters. The history of uppercase is related to that of lower case discussed earlier in this glossary. The placement of the letters in the typesetter’s shelving system created the name. The capital letters were stored in the upper part of the case (the shelving system for the hundreds of letters that the typesetter needed easy access to), hence ‘upper case’. Upload When you send a file (word document, image or video) to a cloud based platform (Facebook, twitter, Basecamp) you are uploading that file to the platform. The technical definition may be along the lines of the transmission of electronic data from one server to another for the purpose of storing the file so that it can be accessed by other parties. This allows easy referencing for the date the changes were made and what iteration the book is at. When in the menu, for Microsoft Office Word, you will usually be provided with an image of what each of functions look like. However, if your focus is the writing leave this detail to your graphic designer. www Initialism for ‘World Wide Web’ and is usually found at the beginning of the hyperlink or URL for a page. The answer depends on your intention for your book. Hopefully, you have a rough idea on this, based on the introduction, conclusion, and blurb you worked up in the last step. There are practical limitations on the minimum and maximum pages and file sizes for printing. Experience has taught me that a book with more than 300 pages becomes too bulky. There can be issues with the stability of the spine with perfect bound books with large page numbers. Other binding methods are generally too expensive to consider when just starting out. For example, CreateSpace (who I use for my print-on-demand [POD] paperback production) has a minimum page number of twenty-four and maximum page number ranging from 200 to 828 (depending on the trim size of your book), while the maximum file size is 400MB (current as at September 2015). These file size restraints change; please check again before you proceed further. You would also need to consider your computer’s capacity and internet connection. Files over 100MB can take quite some time to move from place to place and that can become frustrating. You want to minimise your excuses for not completing your project, so look for ways to make progress easier and success a reality. Practically, if your book it be a paperback it is preferable to contain sufficient pages to create a spine that is wide enough for your title and name to be printed on it. Generally, this is at least 130 pages. However, you don’t want to just fill for fills sake. This will undermine your message to your audience. Who can help me edit my book?